This Wakizashi is papered to the 3rd generation Kanemoto who is also the 2nd generation magaroku kanemoto. The wakizashi is mumei-o'suriage and mounted in shirasaya and original koshirae. The appraisal paper was done by the late Dr Tokuno Kasuo. The shape is described as shinogi-zukuri, low midore-mine, chu kissaki. The jihada ko-itame base mixed with mokume, and a milky shadow from the mine. Hamon is nioi-deki gunome having acute/pointed tempereed three cedar hamon. School 3rd generation magaroku kanemoto. Dr Tokuno said that the blade could be either 3rd or 4th generation but certainly made well before the regulated sanbonsugi or three cedar hamon that later generations of kanemoto were famous for. Dr Tokuno also said the ji and the ha showed skillful workmanship. Dr Tokuno thoughts were that this koshirae was possibly indicate for a castle guard captain or similar, the tsuba is reminicent of the tokogawa. Polish was done by Mr Sasaki of Tokyo. 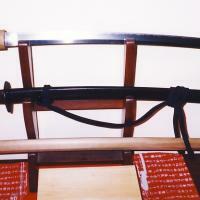 Photo's in gallery show original koshirae for the blade. Wakizashi in shirasaya with koshirae in storage box. Other views of the sword.